Every year, the Christmas season approaches and you cannot escape the onslaught of marketing designed to capture every last dollar from those with money to spend on Christmas. Most businesses shut down for the holiday and Christmas morning in most towns looks like a ghost town. However, while some people fully acknowledge Christmas, many people now make a big deal out of being offended because of the very notion that there is a Christmas holiday at all. They will instead come up with alternative names for the season to avoid even mentioning the name Christmas. In this article, I share a personal message of why I celebrate Christmas. As a young boy, some of my fondest memories were about Christmas. We were not very religious, yet like most families, it was not uncommon to get up on Christmas Day and open our presents. Then before long we put them back under the tree and we packed into the car and headed out to visit relatives all day. It was usually the day after Christmas that we had a chance to really get to spend time enjoying our gifts. It is funny. Looking back, I really do not remember much about what I got for Christmas. But, what I really do remember is the time we got to spend with our family and friends and enjoying each other’s company along with all the different foods. This left an impression with me that even to this day I miss because everyone we loved were together and happy. Years ago, I had taken a calling to a church as their new pastor. It was about a month after Christmas and I was excited to really get to know everyone in the congregation. A couple approached me after one of the services and asked me what I thought about celebrating Christmas. My answer must not have been the one they were looking for as they left the church not long after. Later, I followed up with them to find out why they left. They told me that they could not go to a church where the pastor has anything to do with Christmas. They went on to tell me that everything about Christmas was pagan and that anyone that has anything to do with Christmas is worshiping the devil. I was well versed in many of the traditions that are kept at Christmas and how they come from pagan influences. Yet, I also knew that in the early centuries Christmas was celebrated under the name epiphany on January 6th, a day that was believed to be the day that Jesus was born and later baptized. I went on to emphasize that in our family, we do not engage in all the trappings of Christmas, but have a more of a family and friends oriented celebration where we come together to praise God for providing His Son to be our Savior. Despite acknowledging their concerns, I tried to suggest that because it is a common cultural observance, it gave us the perfect opportunity to share Christ, no matter how we personally may or may not celebrate it. Their closing comment to me was that having anything to do with it is wrong and dishonors God. I tried to encourage them to perhaps go serve others so that their time spent would honor God, but they were not wanting to hear any of it. Instead, they told me they would stay at home until it was over so they did not have to be exposed to it. Sadly, they left and I never saw them again. I am not going to go into the historic origin of the word Christmas. But, for the most part, even most non-believers acknowledge that it is a holiday that was originally created to celebrate the birth of Christ. Culturally, there are a lot of traditions that go along with it. Some are good, and some are not so good. Some are religious and some are totally devoid of anything that is even close to honoring God. However, one thing is certain. The Bible does give us a pretty good account of the events leading up to an including the birth of Christ. From the prophecies in the Old Testament to the actual birth, it is no secret that many people anticipate and looked forward to the day that the Messiah would be born (Genesis 3:15; Isaiah 7:14; Isaiah 9:6-7; Isaiah 11:1-12; Matthew 1:18-23). Is being against celebrating Christmas wrong? Some would certainly believe it is. However, what I find most striking is that most who are dead set against celebrating Christmas at all give the explanation that there are no instructions in the Bible to celebrate it. However, they totally miss that before the birth of Christ there were many people that prayed that God would allow it to happen in their lifetime (Luke 2:25-40). Even when you read the account in Luke 2:1-20 we see that the angels were not shy about sharing the news of the birth and celebrating it. Likewise, the shepherds responded to the news by going into Bethlehem to see for themselves. It is ironic to think that because of how the celebration of Jesus’ birth has been perverted to what it has become today that rejecting the very notion of having anything to do with it is worshipping the devil. So, the question is not if celebrating Christmas is wrong. The question is does our celebration glorify God in a way that is right? Sadly, it is because of a hyper legalistic attitude that some hold against any celebration of Christmas that many non-believers develop hardened hearts when it comes to anything to do with Christ. This is because like those who criticized Christ for eating with sinners and publicans, many who refuse to even fellowship with others during this time communicate to them that they are also rejecting others as individuals that need a Savior. What is even sadder is that neglecting to even fellowship with others during this time ignores the opportunity to go out into the world to share the gospel with people they do not even know (Matthew 1:19-20). How can we celebrate Christmas in a way that is right? Each of us have the freedom to celebrate Christmas in our own way. However, the point to be made is that this does not mean that we have to take part in activities that we should not be doing as believers. But, we should make an effort to bring to mind what the Scriptures say about the birth, life, and most importantly, the death of Jesus and His future return. Jesus, the boy who was born in a manger that grew up to be a man while living a life without sin. The man who lived a perfect life and was without sin because He never broke any of the commandments. The man who because of His sinlessness did not have to pay the wages of sin which is death (Romans 6:23). Finally, the man who loved us enough that He was willing to allow Himself to be wrongfully crucified to pay for our sins so that we can be born again into His family. Because of what He did, we can celebrate the fact that He was born to provide a way for us to celebrate being in His presence for an eternity (1 John 4:10-19). 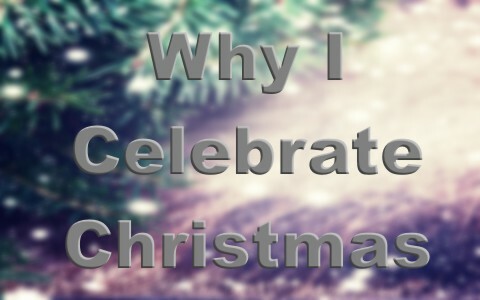 Why do I celebrate Christmas? Because God has blessed me with the opportunity to share the light of God to a world in darkness. Every year, the Christmas season approaches and you cannot escape the onslaught of marketing designed to capture every last dollar from those with money to spend on Christmas. However, many believers want nothing to do with celebrating the birth of Christ for a variety of reasons. No matter what the reason, we cannot deny the fact that the Christmas season provides the perfect opportunity to share why Christ was born and what He was sent to do. If we keep in mind the reason for Christmas, it will provide the guidance we need to make it a real blessing to others and honor God. I personally celebrate Christmas because God has blessed me with the perfect opportunity (during the Christmas season) to share His light to a world in darkness. “I celebrate Christmas”. I, I, I. Congrats you made it about yourself. Lover of yourself instead of God. I believe you are being a bit hard on people and on this person in particular. If you don’t like to celebrate Christmas, it is your priviledge but please don’t judge others who do. That is not a very Christian thing to so. Previous post: Does The Bible List The Names Of Demons? Next post: Does The Bible List The Names Of Angels?